Baby nursery lighting can have a dramatic impact on the look and feel of your baby's room. Once you have chosen your nursery rhyme theme, you'll want to consider the various types of lighting for your nursery. The various types of light fixtures are used for different types of light usages. You'll want an overall light to brighten the room. Perhaps some task lighting for reading, and of course you'll want a night light. Chandeliers are not just for the dining room any more! 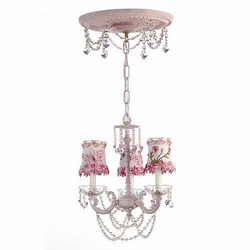 There are lots of newly designed chandeliers that work great in for baby nursery lighting. They can be fancy with crystals and colored flowers to add a touch of glamour to a little girl's room. Or with lambs, bunnies, butterflies or elephants to add whimsy to any nursery theme. 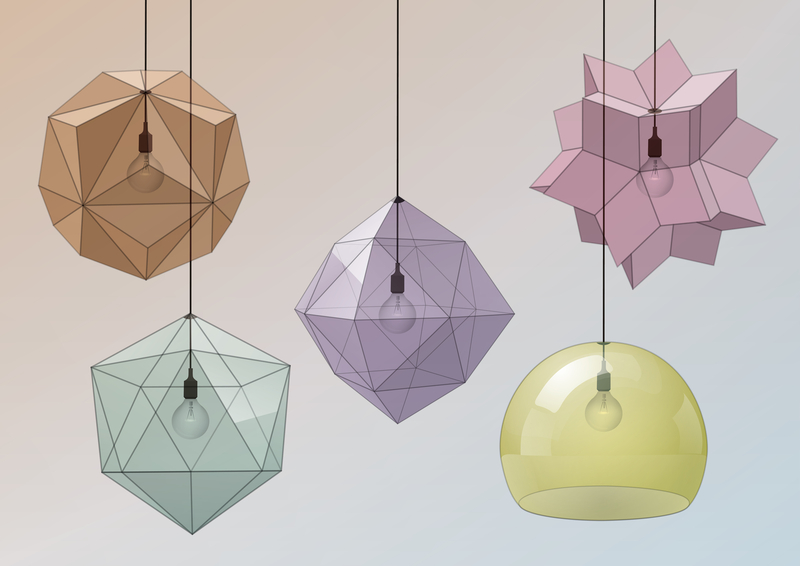 Pendants can be a single light to multiples. They can have various size shades with stripes, dots, waves or prints on them in colors that blend nicely with your color scheme. Shades on the chandeliers or pendants can be found ready made with prints, colors or other decor. Or you can decorate the shades yourself. Use stencils to paint characters or flowers on the shades. Add fringe, ribbons, feathers or other fanciful trim to the top or bottom edges of the shades. Another idea to set the chandelier or pendant off is to install a medallion on the ceiling at the base of the light fixture. Medallions can be simple or with fun characters like rabbits, kittens, flowers, ladybugs or vines. Some even have words or sayings like "Sweet Dreams", "Laugh, Love, Dance". From floor lamps to table lamps, there are lots of selections to place in your baby room. Lamps are great for task lighting. They can sit next to a rocking chair for snuggling and reading. Or next to a changing table for all those tasks like clipping nails, changing diapers and dressing for the day. Wall sconces are generally reserved for hallways and bathrooms. But there is no need to limit yourself when planning your baby nursery lighting. Sconces can have a single or multiple lights to them. They can be used to accent a mirror or a piece of artwork. Designers have created great little wall sconces for baby rooms. Some with moons and stars, lambs, bunnies and so much more. You don't want to trip over anything when sliding quietly into the nursery in the dark to check on your hopefully sleeping baby. A night light can help ensure your safety as well as that of your little one. 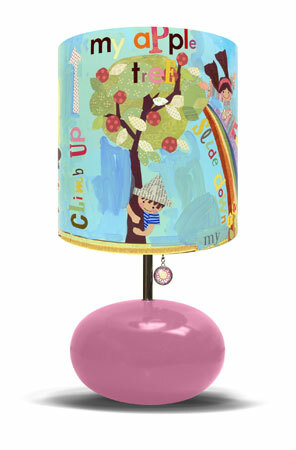 or with tiny decorated lamp shades.......you can even personalize the lights with your little one's name! All in all, lighting is not only functional but can be fun, whimsical and even dramatic. 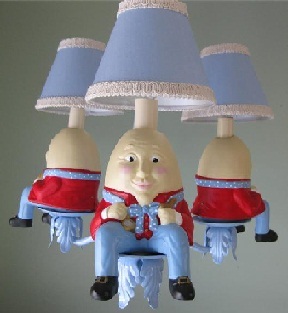 Be sure to include great light fixtures when decorating your nursery rhyme themed nursery! Baby Nursery - Great ways to get started on this all important room! 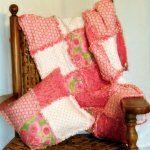 Baby Quilts - Beautiful handmade quilts perfect for any nursery! Bedding - That all important crib bedding helps pull the whole room together! Ceilings - The fifth wall can be fun to decorate! Colors - Colors for nurseries can be pastels to brights! Flooring - Flooring easily adds comfort to your baby's nursery! Furniture - From cribs to dressers, there are lots to choose from! Nursery Rhyme Theme Nursery - Nursery rhymes make great themes for your baby's room! Wall Finishes - From paint to paper, your theme can come to life on your walls! Have a Nursery Rhyme Theme Nursery? What a delight you must have brought to your newborn's room. Nursery rhymes bring such whimsy and creativity to a child's life. We'd love to hear about the rhyme you selected, how you brought it to life in your baby's room. What special little details did you create to make the most wonderful nursery ever? Tell us about the fun you had creating this incredible space for your newborn! A picture is worth a thousand words! So why not share pictures of your delightful nursery with us? Proudly show off your talents!